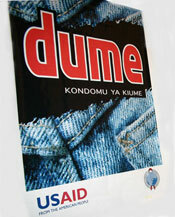 Dar es Salaam, Tanzania - T-MARC and its marketing partner Shelys Pharmaceuticals formally launched the new male condom brand, Dume, on March 28 at the New World Cinema. The launch event was very successful and widely attended by influential persons and partners from the private sector, the government of Tanzania, the US Embassy, USAID and its cooperating agencies (CAs), NGOs, and civil society. There was extensive press coverage on national television and radio, and in local newspapers. US Ambassador Michael Retzer, and Reginald Mengi, Chairman of IPP Group, a leading businesss consortium and media house in Tanzania spoke at the event, and Minister of Health, Prof. David Mwakyusa, delivered a video statement. The launch event featured an educational documentary video that illuminated the HIV prevention issues facing vulnerable groups that comprise the target audience for Dume.